Moss is a member of a division of plants called bryophytes. Bryophytes are simple, non-vascular plants which have no roots, stems, or leaves. There are approximately 10,000 species of mosses, but they generally appear as small, soft, plants which grow to 4 inches in height in clumps or mats. Moss has an important role in nature; they grow on bare rock and contribute to soil development, form thick carpets that can reduce erosion and they act like a sponge retaining and slowly releasing water. Because they have no roots mosses must take in moisture through their 'leaves'. As a result they are found chiefly in areas of low light and high humidity. They are common in wooded areas and at the edges of streams. 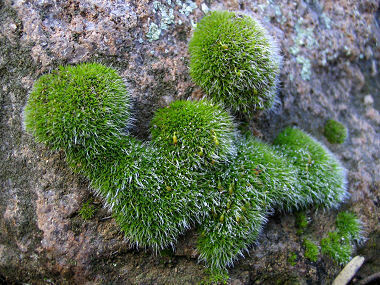 Mosses evolved approximately 350 million years ago, before dinosaurs, reptiles, birds and insects. At this time flowers and seeds had not yet evolved due to the fact that there were no creatures around to perform pollination. Instead mosses reproduce through spores. The advantage of spores is that they are small and lightweight and thus able to be borne long distances upon the wind. The disadvantage is that they do not contain much stored energy and therefore have to land in a spot where conditions are ideal in order to survive.